One of the more obvious reasons for switching to EFI from the Mac’s virtual BIOS/Boot Camp method is that your boot times will greatly improve, especially if you’re using an SSD (see the video example below). For example, your boot time could go from 25 seconds to as little as 3, but that’s on a fresh of install of Windows and isn’t very representative of real-world numbers. And quite honestly, that’s the only reason I see switching from the traditional BIOS method to the EFI method. Going this route isn’t so simple, and you’ll more than likely run into hardware compatibility problems afterwards that only Apple can fix with EFI updates. In addition, it will take a fair amount of time to complete. If you follow the steps closely, you shouldn’t run into any issues. Keep in mind that everybody’s Mac hardware is different. I completed this on my 2012 base-13″ MacBook Air. All told, the boot times have increased tremendously. But as mentioned above, this was on a fresh install of Windows 8. After you set it up the way you want, it’ll more than likely slow down. Boot times through the traditional BIOS method isn’t dramatically far off afterwards, either. Interestingly, I found great interest in all of this. I’m pretty advanced when it comes to hackintoshing, which is where you can install Mac OS X natively onto a regular ‘ole PC. Now, I’m working the other way around, where I’m getting Windows to boot as natively as possible on a Mac. My below guide is based off of a guide by “mac-hacks” on MacRumors, which can be found here. Your data will be erased. This is because we’ll be redoing the entire partition structure of your HDD or SSD. Because of this, make damn sure you’ve backed up all of your necessary content. For me, I had an existing copy of Mac OS X 10.8.2 installed, so I simply did a Time Machine backup that I later restored without any problems (more on that below). I also had an existing copy of Windows 7 installed, so I just made a few screenshots of what I had installed so that I can redownload and reinstall them later. This method will also take a fair amount of time. Make sure you have at least an hour of free time to dedicate to this, plus the time it’ll take you to get your operating systems back to the way they were before. Also, this isn’t guaranteed to work for everyone. 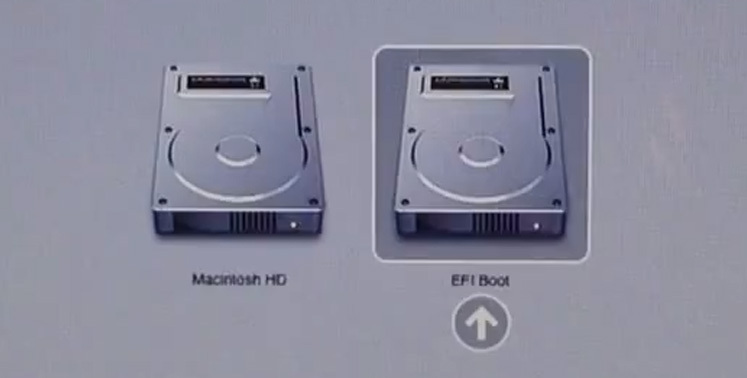 Users of older Mac computers may have older and discontinued versions of the Mac EFI. You can test this by booting from Windows EFI from your USB flash drive, assuming your Mac supports booting from USB drives to begin with. Lastly, even after everything’s installed, there’s a good chance that certain hardware in Windows won’t be working properly. In my case, audio wasn’t working, and neither was hardware-accelerated video/graphics. This isn’t the fault of Windows or various drivers, but rather the way Apple’s EFI implementation is. I’ve yet to find a way to fix this. Honestly, I went right back to the traditional BIOS/Boot Camp method after getting this post up, since the slightly faster boot times weren’t worth critical hardware not functioning properly. First, you’ll need two USB flash drives, one that will be for Mac OS X, and the other that will be for Windows 8. Once you have those, prepare your Mac OS X drive by using Lion DiskMaker, which itself requires that you have the original copy of Mac OS X 10.7, 10.8 or 10.9 somewhere on your computer or external media. For your Windows 8 USB drive, you can use Microsoft’s Windows 7 USB/DVD Download Tool from within Windows to “burn” your Windows 8 .ISO file to the USB flash drive. Since we’re dealing with USB drives, your Mac may or may not support booting from them. Test this out with the Mac OS X or Windows USB drives. If they show up when you hold ALT/OPTION after you press the power button, then you’re good to go. Other than the backup statement under Precautions, that’s about it. Now, onto the instructions. This is where we start to reconfigure your entire HDD or SSD. Power down your Mac, and plug your Windows USB drive into any available USB port. After you press the power button, old the ALT/Option button until you see your partition listing. After a few seconds, the EFI Boot option of your Windows USB drive should be available. Select it, and press enter. Within 30 seconds, you should be at the main screen for the Windows 8 installer. Once there, click on Repair Computer. After that, go through the few Advanced menus until you get to the Command Prompt. Now, the destruction begins. Now that your drive has been reconfigured with no data on it, we can get your Mac OS X stuff back up and running. Depending on whether or not you made a Time Machine backup, you can choose to restore that, or install Mac OS X from scratch, both using your Mac OS X USB drive. First, we’ll have to format the partition as Mac OS X Extended (Journaled), aka HFS+ with Disk Utility. To do this, boot from your Mac OS X USB drive. At the main menu, open Disk Utility. In the left sidebar, you should see a partition labeled “disk0s2″ under your main drive. Click on it, and in the main content area, click on the Erase tab. Give it a title if you’d like, but for the format, choose Mac OS X Extended (Journaled). After you’ve done that, click on the Erase button. Exit out of Disk Utility. Now, you can choose to do a clean install of Mac OS X, or restore a Time Machine backup that I made onto an external USB hard drive of mine. The restore went without a problem, and my MacBook Air even automatically rebooted itself into it. This isn’t really a “boot from the installer and click on install” sort of thing, as you’ll now see. It should say that the boot files were successfully copied over. If that’s the case, then you can shut down the Windows 8 EFI installer. Unplug your USB drive, and reboot your Mac, holding ALT/Option to bring up the boot list. If all was successful, you should see “EFI Boot.” Highlight it, and press enter to boot into it. You should instantly see the Windows 8 boot screen. After a moment, your Mac should reboot itself back to the Windows 8 boot screen. If it does that, and your display simply goes to a blank, black screen, then follow part 3b. I had to do this. If you get into Windows 8 as expected, then you’re done! For me, I experienced the black screen issue, where it would just sit there forever. A fix for this is to remove the igdkm64.sys from C:\Windows\System32\Drivers. To do this, hold CMD+ALT/Option+V+Shift after you press the power button. If it worked, you should see your Windows boot screen with the text “Please Wait” below it. If it didn’t do this, do a hard shutdown (hold your power button for 10~ seconds), and try again. It might take you a few tries to get to the right menu. Now, when you reboot, it should boot right into Windows 8, asking you for your key (yay!). If you ever get a black screen again, follow the above steps. It seems as though the integrated GPU drivers, even after installing the official Intel ones, simply won’t get it to work, so resorting to Microsoft’s basic Intel GPU drive is the only way to avoid the black screen mess. Also, audio isn’t working. If you’re running into trouble, leave your comments/complaints/suggestions/feedback (in detail!) below, and I’ll try to help you out.